Mastrio Web Page » The Archive » Busy this Friday 5/25? 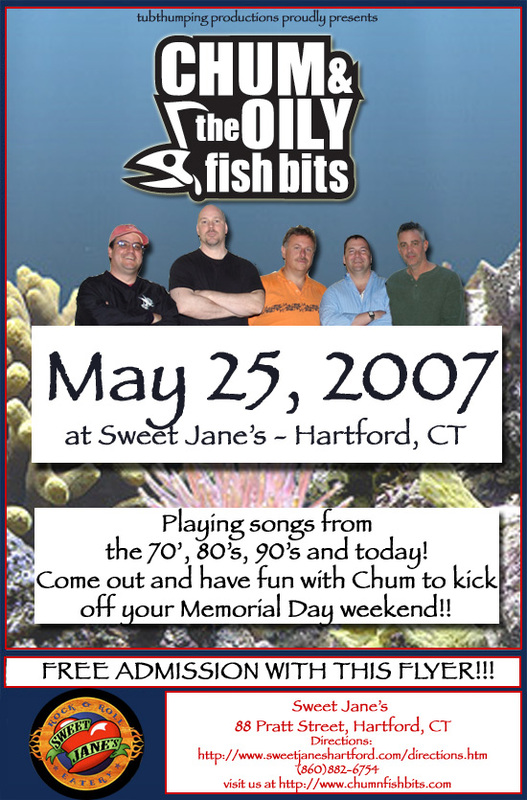 My band, Chum and the Oily Fish Bits, is playing at Sweet Jane’s on Pratt Street in Hartford this coming Friday, May 25th! I haven’t played in Hartford in years and am looking forward to it big time. We’re looking for a good turn out, like we always do, so why not come out for a drink or two, a laugh or two and a dance or two?? Sweet Jane’s is a cool place to come out and party – they have a nice big bar and plenty of room to get out and shake. Hartford has sure changed since the days when I’d go bar hopping to the Russian Lady, Scarlett O’Hare’s, BT’s and Chuck’s Cellar. If you remember any of those places – admit it: YOUR GETTING OLD. On a side note, the following night (5/26) my buddy Joey Joe Joe’s band Wicked Garden is playing Sweet Jane’s! Looks like if he shows up at my gig I’ll have to reciprocate. If so, and you can’t make it on the 25th, drop me a note and I’ll go with you Saturday night! Hey, I was just about to post this on MY blog!